I’ve really set myself up for hangry-ness as I type this post. 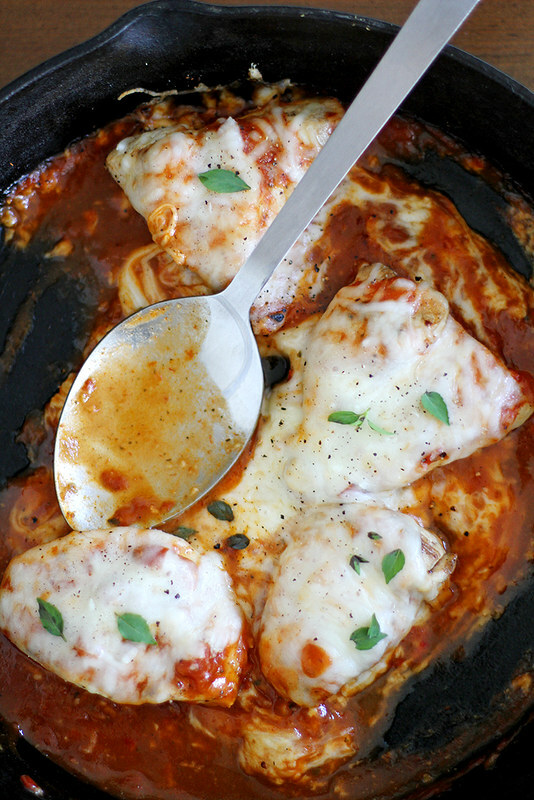 Not only is it right before breakfast, but there are fresh-baked brownies on my kitchen counter aaaaand I’m staring at photos of this grilled chicken Parmesan. Good grief, I am HUNGRY. Good thing this recipe takes like two seconds to throw together (OK I exaggerate, but it’s really, really quick and easy) and friends, it is deee-licious. And I am going to tell you about it real fast so I can eat breakfast (which may be brownies) while dreaming about making this dish again for dinner. Mmmmhmmm. You’re probably all, “Um, OK Steph, chicken Parmesan sounds kind of been there, done that,” and I’m all, “Yes but this is way different and you’re going to love it!” The reason being because the whole dish is made on the grill. Yep yep yep. No need to slave over the stovetop to make some comfort food yums when you can be outside enjoying these few precious days left of summahtime making it. Have I mentioned that it’s also super quick and easy? Chyeah. It’s getting G-O-O-D. 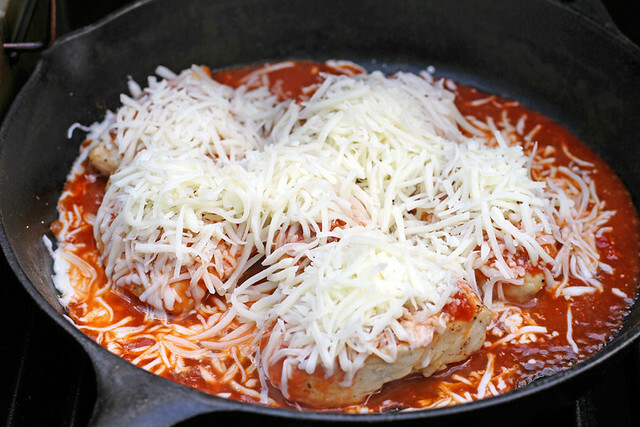 The kind folks at Progresso asked me to share a recipe using their Recipe Starters cooking sauce to make a tasty and easy dinner on the grill so we can all enjoy the rest of our summers a little more, and that is how this grilled chicken Parmesan came to be. But even I was surprised by just how simple the process of making this dish was — I mean, I’m a pretty impatient person when it comes to food (see above, “hangry”) especially when things like fire-roasted tomato cooking sauce and ooey-gooey melty cheese are involved, and this dish didn’t make me wait any longer than I wanted to. It was fantastic. Thanks, grill. So here’s what you do: Firstly, grill the chicken. 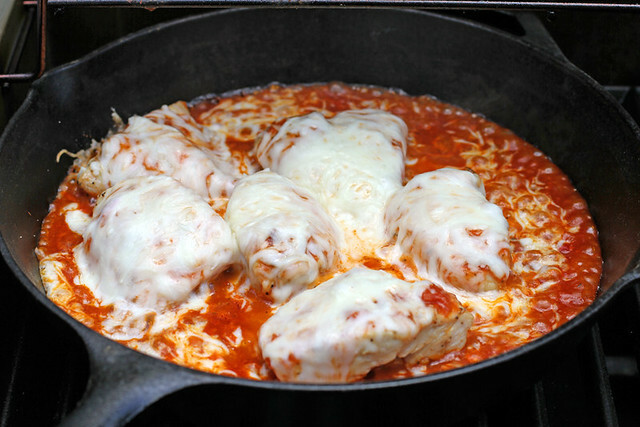 Secondly, put the chicken in a cast-iron skillet (I know, it’s turned into a skillet week around here by happy accident) on the grill and cover it with cooking sauce and ALL THE CHEESE. Thirdly, let it cook until that cheese is melted to heavenly meltedness. Fourthly, serve it atop a bed of pasta (or on its own, mayhaps with a salad on the side?) and fifthly, eat it all up. And the repeating of step five is highly encouraged. Of course, if it’s a rainy day or you don’t have a grill or whatever, you can make this whole dish on the stovetop, as well: Just cook the chicken on a grill pan or directly in the skillet before topping it with the sauce. No matter what, you’re about 30 minutes and five ingredients away from comfort food deliciousness in yo’ face — in the nicest, least hangry way possible — giving you more time to enjoy these waning days (sniffle) of summer. P.S. Check out the recipe on Progresso’s site here, plus more yummy ideas for the good life! 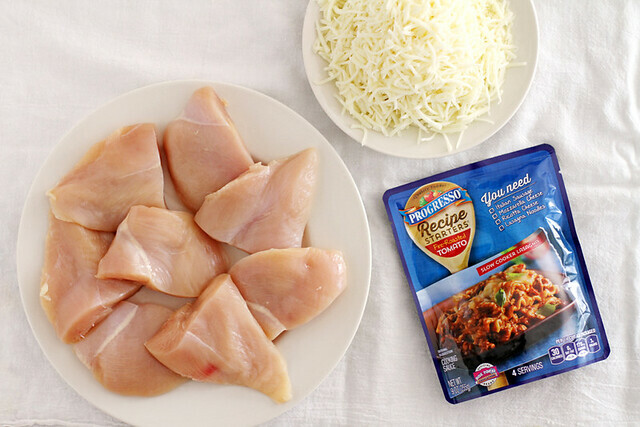 Slice chicken breasts in half widthwise; pound out with a meat tenderizer to an even thickness. 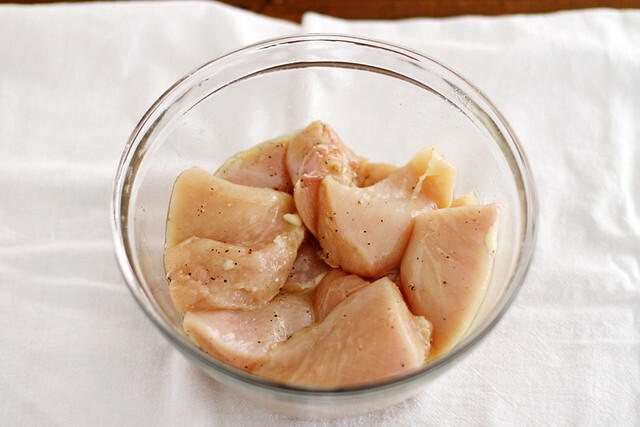 Toss chicken pieces in a large bowl with olive oil and salt and pepper. Heat grill to medium-high heat (about 375°F to 400°F). 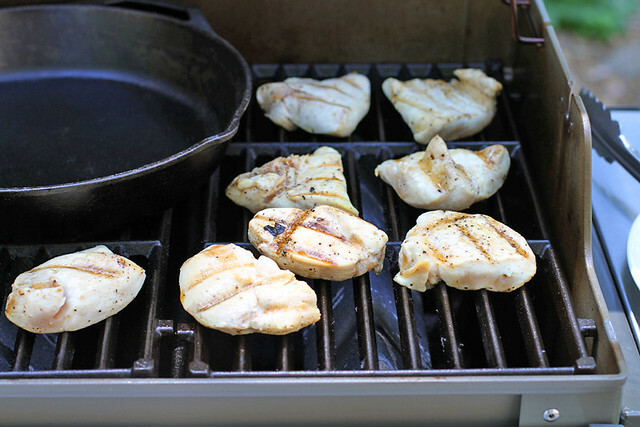 Place a large cast-iron skillet on one side of the grill, and place chicken pieces on the other side of the grill. Cook chicken 3 to 4 minutes on each side until grill marks appear. Transfer chicken to heated skillet. Top evenly with sauce, then sprinkle with cheese. Cover grill and cook 5 to 7 minutes until cheese is melted, sauce is bubbling and chicken is fully cooked through. 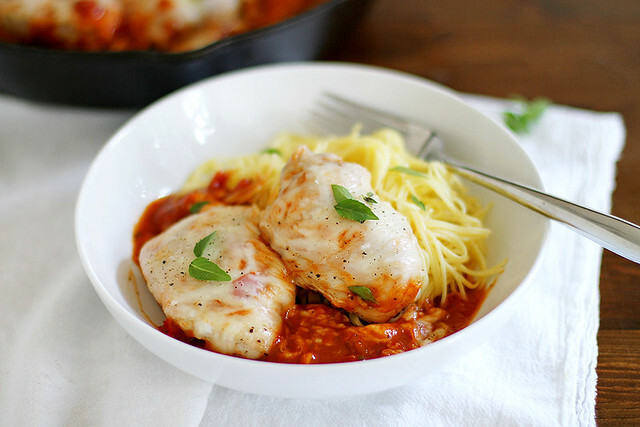 Serve chicken on top of pasta sprinkled with fresh basil, if desired. Disclosure: I received compensation from Progresso for recipe development purposes. All opinions are my own. I cannot believe this is all done on the grill! Makes life five million times easier. Oh yes!! I bet the grilled smokiness makes it over-the-top good! Love it! Can you believe we haven’t even put our grill together yet??? Needs to happen NOOOWWWWWW! All grilled dinners are so easy. I love this idea and I mean all the cheese. Yum! With the grilled kind though, it seems that I can invite everyone I know to come join in the chicken-n-cheez explosion of AWESOMENESS! We make grilled chick parm, too – but we grill the chicken tenders then top it with a schmear of tomato sauce and a slice of provolone and finish it under the broiler. Love your all-grill idea… even easier!! It’s gonna be a hot one this weekend around these parts and this dish, on the grill sounds like a perfect way to beat the heat! Looks deeeeevinnnneee!! I love cooking on a grill w/ a cast iron! 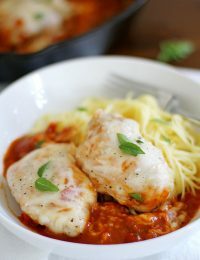 You know, I haven’t really thought of chicken parmesan in a long time, but it’s so good and such a comfort food for me. Thanks, Steph. Love that this is all done on the grill! I need to add this to our menu soon! Pretty much dying for this! These recipe starters look so easayyyy! How cool! I need to check ’em out! Ha! I make myself so hungry all the time when I edit photos! And this looks awesome – so cool that you do it on the grill like that! It is classic Italian dish-grilled. Should be an “A” on the end of Parmisan. 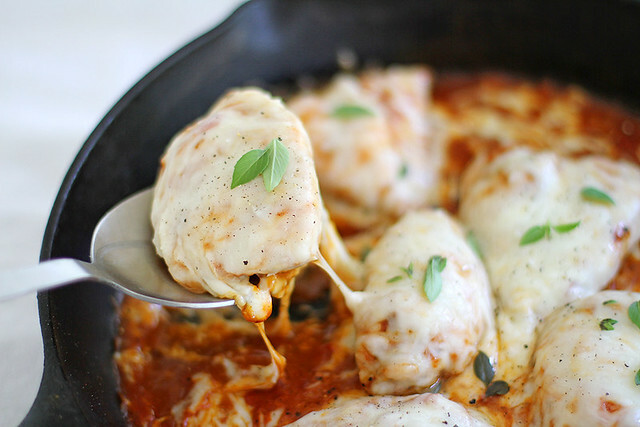 Chicken parm that isn’t fried and is super easy?? You’re my dinner hero. I love that you grilled the chicken. It’s so much easier than breading and baking. Love this! You make me HANGRY at night!! This looks very deeelicious! 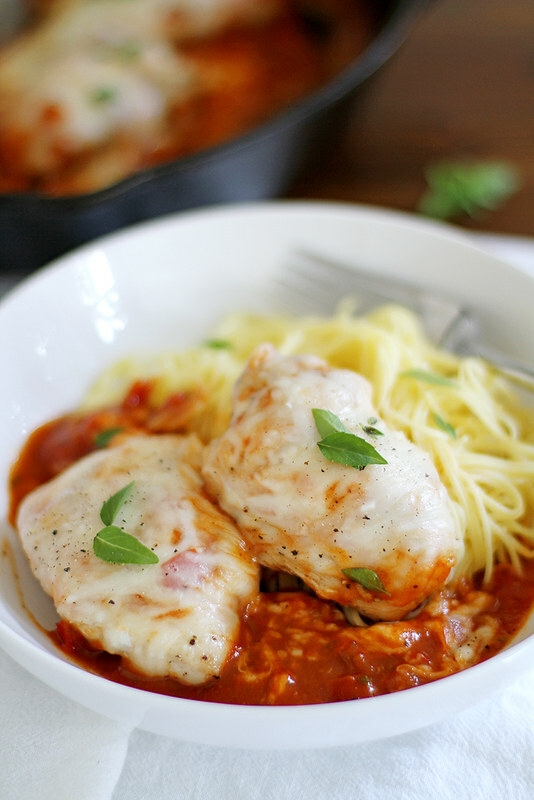 Wow this chicken parmesan looks amazingly cheesey, hearty and of course delicious! I must try out the recipe.. thanks for sharing it! Total yums! 30 minute meals are a blessing around here! Bring on healthy, easy, and delicious! I want a big plate of this right now! I’m loving this recipe! It’s so much healthier than breading and frying. Side note. Editing and posting food like this always makes me hungry too! I cannot express to you how badly i want to try this. Pinned! I love that you threw this on the grill! Pinning this idea for dinner soon.